The Québec City World Cup has been a wild ride for the first two days, which are really only setting the stage for the big event. On Sunday, two crystal globes will be decided and hometown superstar Alex Harvey will retire on a course he raced on as a child. The first two days have brought wildly varying conditions, but both were challenging. 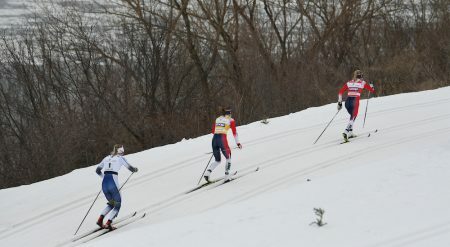 Rain on Thursday evening caused sugar snow conditions on much of the sprint course Friday, with challenging skating conditions and some hard crashes. More rain on Friday evening delivered hard and fast courses for Saturday’s classic mass start. The tracks stayed hard, while the outside snow slowly softened. 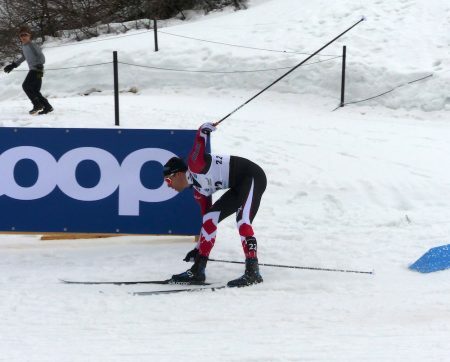 In the 15km, Alexander Bolshunov pushed a pole through the crust with 2km to go, snapping the pole and gifting the rest of the top group an opportunity to get a gap. Jessie Diggins, Charlotte Kalla, and Sadie Bjornsen got together on the first corner in their quarterfinal, after Diggin’s ski was stopped by either Maiken Caspersen Falla’s pole or Charlotte Kalla’s ski. Frida Karlsson escaped the carnage. A longer sequence in full resolution is available at Doug Stephen’s Flickr page, including the struggle to untangle. “I think I never skied in these kind of conditions. It was really hard. It will definitely be a tough race tomorrow as well. Yesterday, was perfect conditions. Too bad, that’s kind of outdoor sports.” — Pål Golberg, on Friday’s sprint and Thursday’s official training. “Ah, you can’t do anything with the weather. It’s still going to be the best person wins today, it’s still going to be snow. It’s an outdoor sport, that’s how it is.” — Andy Musgrave has clearly been drinking the Norwegian koolaid. “For me and I am sure some of the bigger guys, it is always a little frustrating when it is soft. But it wasn’t just the conditions, I made a couple of mistakes that I am much more upset about than the conditions.” — Lenny Valjas, on the sprint. 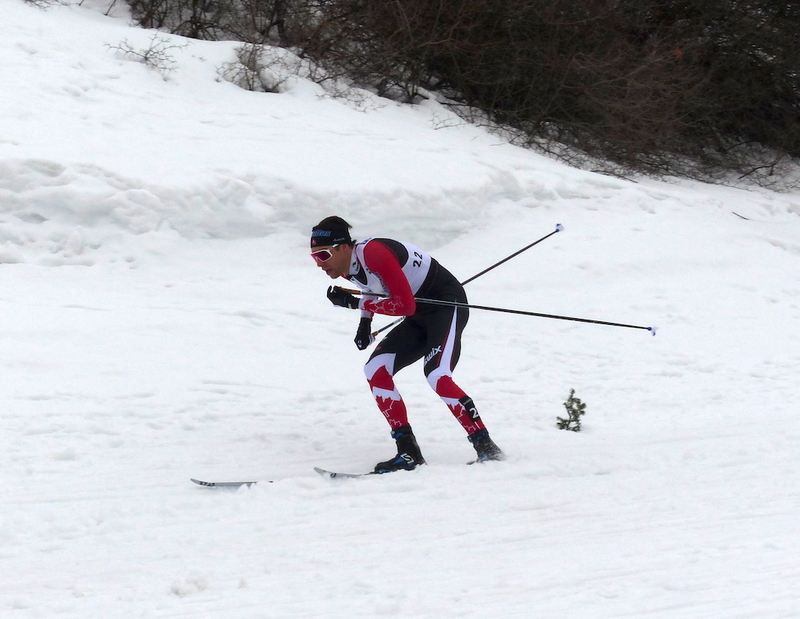 “ It was good, the course is soft and changing rapidly, which makes it a little difficult to figure out what you’re going to get, but everyone’s dealing with the same stuff, and this is just part of ski racing in the spring.” — Ben Saxton, on the sprint course. Frida Karlsson: Yes, I like the conditions here. FasterSkier: That’s a first. Why do you like this? Frida Karlsson: It’s challenging and I like to challenge myself, and I see it in the positive way. — Frida Karlsson liked the soft sprint snow. Really. “It was a lot of fun. I was sort of worried about the conditions, but it was super-fast, hard packed and made for a really fun, fair race.” — Lenny Valjas, on the classic course. “I think by far the hardest part about today was the poling. It was just super rotten everywhere, the tracks stayed firm, which was nice, but the poling trenches just got so deep.” — Simi Hamilton, on the classic conditions Saturday. “It was tricky out there, it was definitely one of those days, it was a little frustrating. But, the whole crowd and the scene and everything was fun so it made up for it.” — Sadie Bjornsen had marginal grip in the 10km. “After yesterday being so sloppy it was pretty hard and fast out there today. It was fun, but it made the downhills pretty sketchy.” — Sophie Caldwell, after the classic. “The conditions were very fast today, and a lot of crashes. When someone else crashes in a track like this, they usually take someone else out. […] Some of the girls need to do more downhill skiing!” — Astrid Uhrenholdt Jacobsen has training suggestions. Alex Harvey: Pellegrino almost took me down. Chicco Pellegrino: No, no, no! Two times! Only ladies ski like this in downhill. — Pellegrino was walking by Harvey during the interview with FasterSkier, so Harvey interrupted himself to trash talk Pellegrino. Pellegrino counter-attacked with an imitation of Harvey’s snowplow posture. Harvey is a huge personality in Québec. His largest personal sponsor is a media company, Québecor, and the company has used its knowledge to grow Harvey’s brand. Hundreds of people saved the ‘Harvey head’ cutouts from the 2017 World Cup finals and were waving them Friday and Saturday. There is much media attention on the retirement. Harvey has two assistants on site, both helping schedule media time. Even other skiers were excited to see Harvey on the podium in his final weekend. After the race, Klæbo started his winner’s interview by talking about Harvey. At the end of the race, Klæbo chose his pursuit of the crystal globe over gifting a victory in the 15km classic. On Saturday, the Plains of Abraham were filled with fans chanting “Alex! Alex! Alex!” and it was possible to hear where the lead group was just by the roar of the crowd. At the end of the race, Pierre Harvey dashed into the finish area to hug his son, who was crying with happiness. “My skating shape has been really good this year, so I hope to be up there, fighting for a podium. We’ll see. I hope Harvey wins.” — Didrik Tønseth on the Sunday pursuit. “I’m so proud of Alex, that he was able to have one of his super races at home here on one of his last days. It was so amazing to hear the crowd when I was racing.” — Lenny Valjas. With both of the overall crystal globes up for grabs, Sunday promises to be exciting. As the Russians do not have a translator this weekend, the Russians have not been granting interviews, only the Norwegians having been talking (in English). Stina Nilsson will start first on Sunday, followed by Østberg (33 seconds) and Johaug (49), and then three more Swedes: Dahlqvist (1:10), Sundling (1:19), and Ebba Andersen (1:24). Nepryaeva needs to place first or second to have a mathematical chance at the crystal globe. With Nepryaeva starting 20th at 2:10, Østberg needs only finish in 20th place to guarantee success. That said, after the challenging conditions on the first two days, it might be Nepryaeva’s turn with good luck. The men’s crystal globe remains close. Johannes Høsflot Klæbo leads Alexander Bolshunov by 42 points. 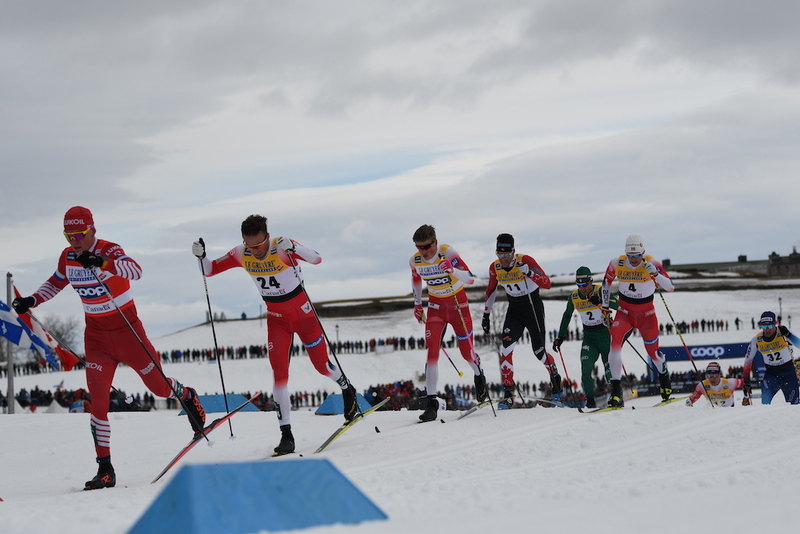 Simen Hegstand Krüger, Didrik Tønseth, and Emil Iverson all have a mathematical possibility of catching Sjur Røthe for third. Klæbo raced his first World Cup pursuit here in 2017, and it was also his first time as the lead skier. Norway has worked all weekend to try to improve Klæbo’s chances. In the sprint heats, Klæbo, Chicco Pellegrino, Bolshunov, and Victor Thorn all chose the first heat, presumably with the goal of getting lucky loser spots. Emil Iversen and Pål Golberg, qualifying 16th and 18th, also selected the first heat which created an amazingly stacked quarterfinal. With bonus seconds (but not bonus points) available in the classic sprint, the team was able to increase Klæbo’s headstart to 52 seconds over Bolshunov, with the points gap at 42. Harvey starts at 53 seconds, followed by a block of Norwegians at 1:07 to 1:25: Skar, Tønseth, Iversen, and Røthe. Pellegrino, the wily veteran, is at 1:13 and should be able to ride that train. With 200 points to the winner and 160 to second place, Klæbo is guaranteed to win the crystal globe by beating Bolshunov or coming second to him. Of this entire group, only Røthe and Tønseth aren’t sprinters. In the past, Norwegians have refused to chase down their own teammates, leaving the work to other teams. Iversen doesn’t think this will apply on Sunday.